Answer to the RiddleWhere do white pines spend the night when they're on vacation? Bo Dodge, a 6th grader in Mr. Wes Blauss's science class at Hanson Middle School, Hanson, MA., submitted our first Forest Watch riddle! Bo and his classmates assessed hundreds of white pine needles for tip necrosis and chlorotic mottle, two types of damage caused by ozone. As Mr. Blauss says, Bo's joke is "a rare bit of repartee." 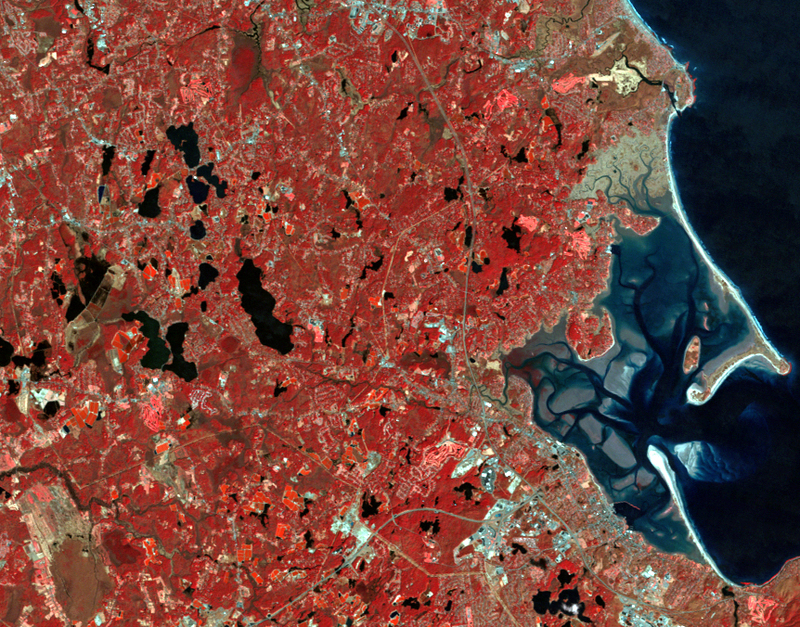 BO DODGE earned his school a set of six Landsat images of Hanson Middle School, its town, Hanson, Massachusetts, and the stunning south shore of Massachusetts and Plymouth Bay. Forest Watch invites schools everywhere to use Landsat imagery. 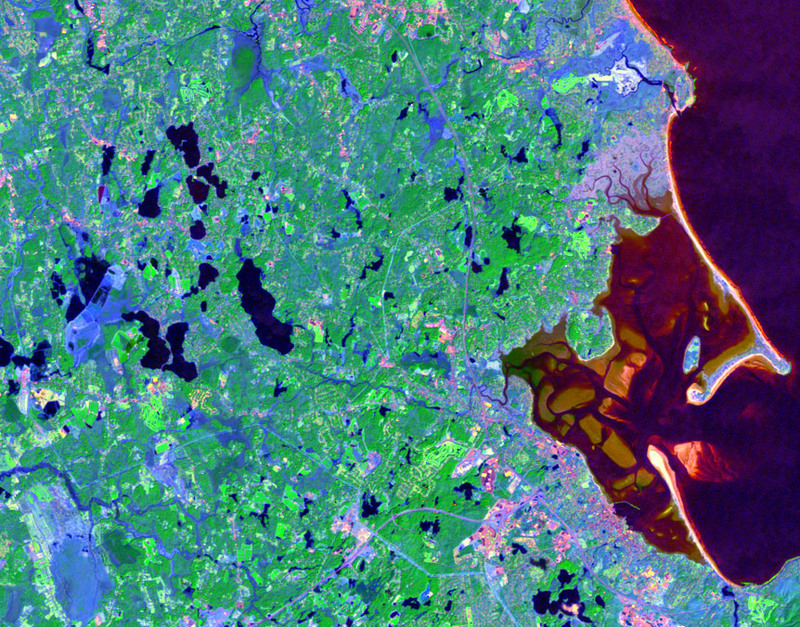 A new satellite, Landsat 8, is about to begin producing data, amazing images of our planet. Landsat provides us with a continuous record of Earth since the 1980s. Students can compare what their schools and communities looked like 30 years ago and what's happening today. They can also examine Landsat data in different combinations of light. These varied views of one site provide scientists with valuable information about water, plants and human structures. Landsat data sets are downloadable free to anyone from the U.S. Geological Survey. Data sets can be interpreted and viewed with freeware produced by Purdue University. MultiSpec has a steep learning curve at first but opens the world of satellite data to eager students. At Forest Watch, we know many science teachers and their students do not have time to learn how to manipulate the data. So we are producing images for you. These jpegs can be used on any computer, enlarged and compared, without any special software. Study the Hanson photos. 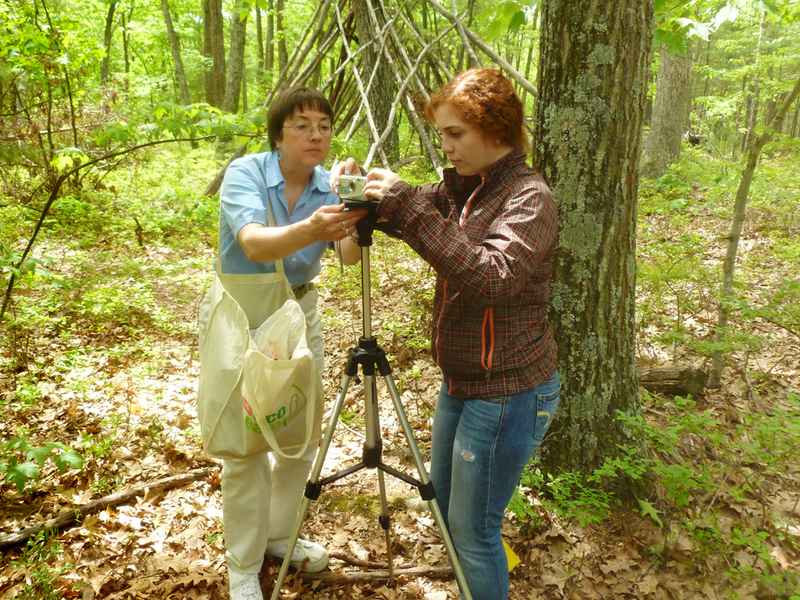 If you and your school would like a set for your location, email us at forestwatch@sr.unh.edu. 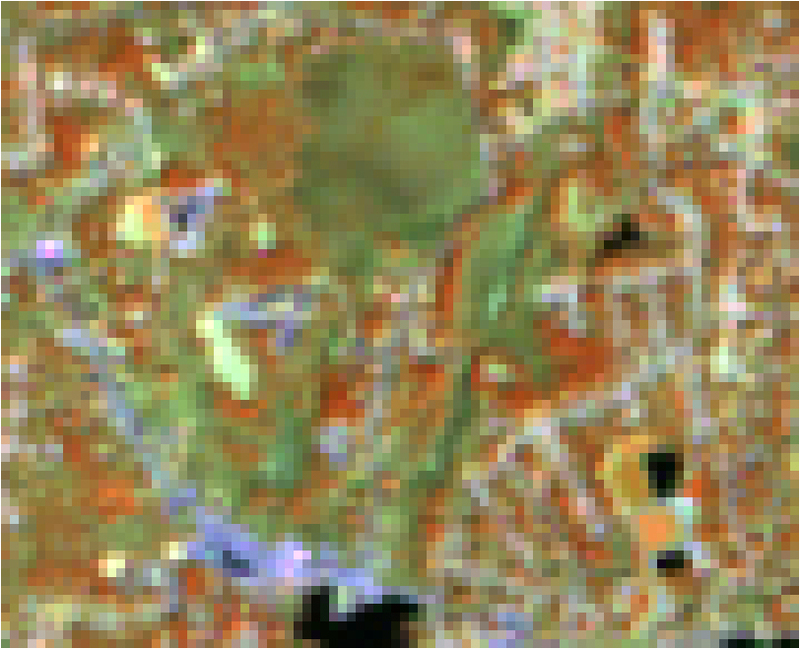 A March 26, 2011, image of Hanson, MA, and Plymouth Bay shows a 4,3,2 selection of Landsat data. Infrared light, band 4, is in red. Visible red light is in green. And visible green light is in blue. Plants absorb strongly in visible light. They reflect almost all infrared light—turning this image red where plants are. Image #3 shows a closeup of Hanson Middle School with a 7,6,4 view. The reflective infrared band 4 is now in blue. Water-stressed areas are in green. In March, deciduous forests, farm fields and Hanson's famous cranberry bogs would have little vegetation on them. Do these account for the bright green blobs? 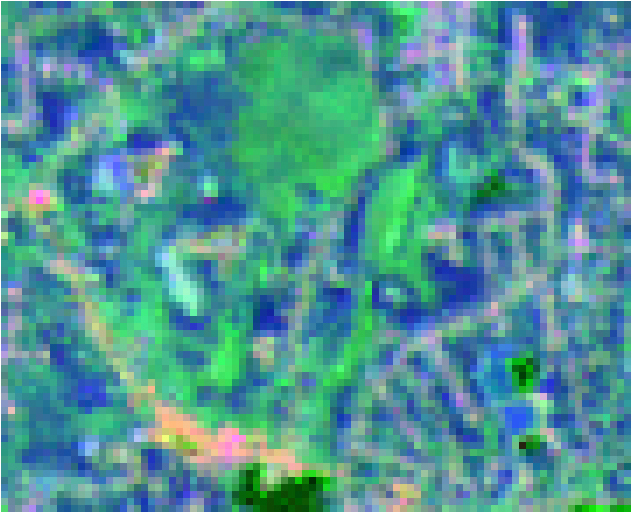 Image #4 shows the same area with a 6,5,4 selection. Now water stress is shown in red. Again, what are those areas near the school? What is that very bright red spot at the bottom of the image? (click image to enlarge) Image #5 shows a 4,5,3 selection. Band 4 is in red and may show where Hanson Middle School's white pines stand. The mystery blob is bright green. 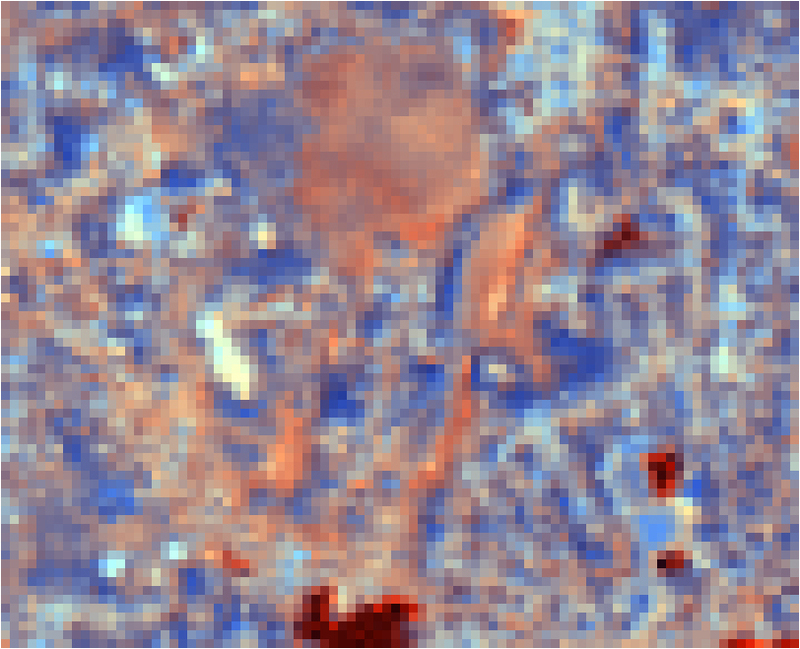 Band 5, which describes the mid-infrared region of light, helps define water content of vegetation. Is this a bog, a field or a maple forest? (click image to enlarge) Image #6 puts the image in a 3,7,2 selection. Visible red light is in red. The NDVI measure of biomass is in blue. Green light is in blue. This combination produces an odd color mix but look what stands out clearly: roads and building rooftops. Can you see the school? ReVision Energy Makes Gift REVISION ENERGY, the largest solar hot water and electricity systems installers in northern New England, recently donated $500 to the Forest Watch Fund. The gift is our first from a corporate donor. We are thrilled. ReVision Energy's focus on solar closely matches Forest Watch's growing concerns about climate change and our increased emphasis on photosynthesis and light. ReVision selects a non-profit each month for a charitable gift. We were nominated by Will Kessler who received a masters in science degree here at UNH three years ago. Now Will works in Portland, Maine, as a certified solar installer. We've invited Will and his colleagues at ReVision to join us next May for the Third Student Convention. Maybe ReVision will recruit a few 7th graders for future work as solar scientists. If you would like to consider a gift to the Forest Watch Fund…. Student Convention Hosts 90 StudentsNINETY STUDENTS and their teachers visited UNH on May 31 for the second Forest Watch Student Convention. 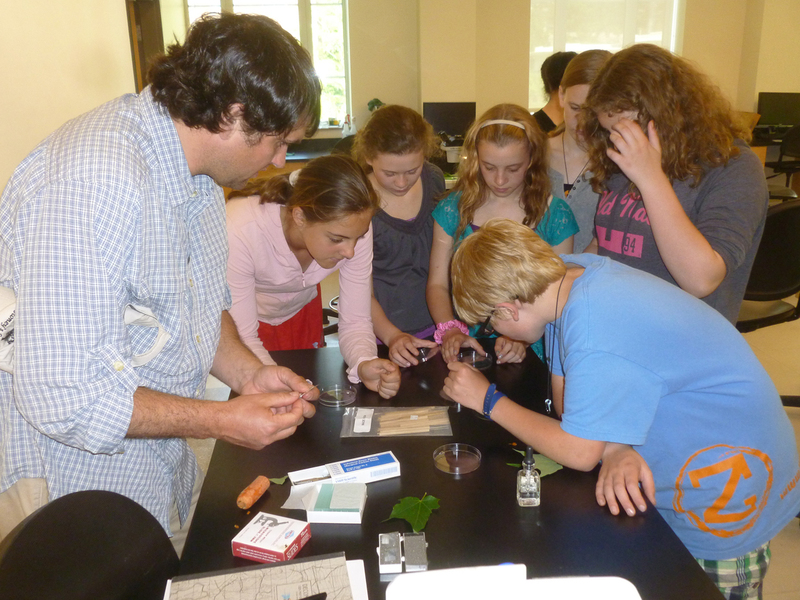 Seventh graders from the Gilmanton School, Gilmanton, NH; the Josiah Bartlett School, Bartlett, NH, and Meridian Academy, Brookline, MA, presented their research to scientists and visited numerous laboratories. Gilmanton students and their teacher brought two posters to Morse Hall: One poster explored the health of white pines in their new study site. A second poster examined "What's Bugging Our White Pines." The students learned that the culprit was a white pine weevil which likes to lay its eggs in the lead stems of young pines, just like Gilmanton's trees. Mrs. Fougere's students brought samples with them to show to Dr. Cheryl Smith, UNH Extension Plant Pathologist, a plant doctor. Dr. Smith dissected the twigs and showed the students how the weevil's larvae tunnel around the soft tissue just under the bark, killing the leader. 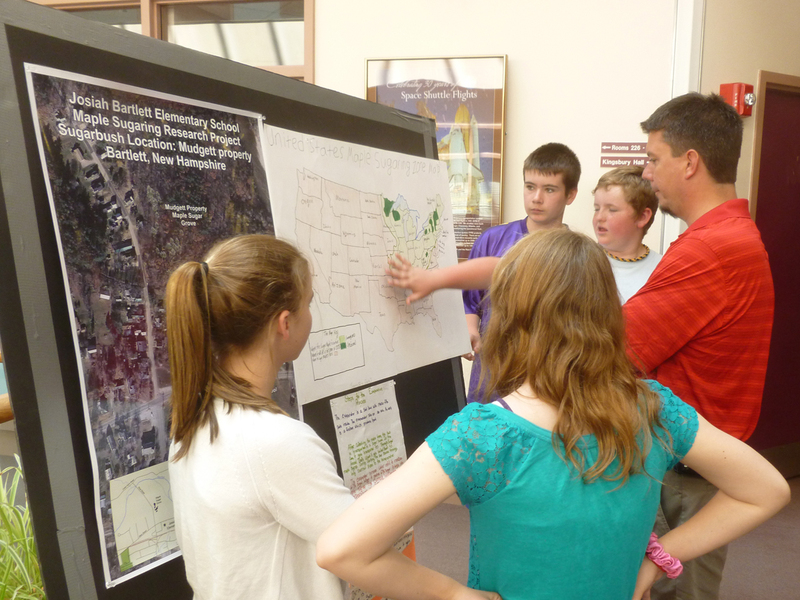 Meridian Academy students brought a poster in which they compared their urban trees with trees in rural schools. These students and teacher Stephanie Kinkel toured space research labs in Morse Hall and learned about solar plasma with Dr. Mark Popecki. Bartlett students brought posters of their research into sugar maple science. They brought samples of soil from their “UNH tree” to examine with soil scientists Mel Knorr and Sarah Andrews. Kevan Carpenter, Dr. Kirk Broders, Phil Browne, Martha Carlson and Betsey Holland also gave students tours and lectures. Students ended the day with lunch at Holloway Commons. 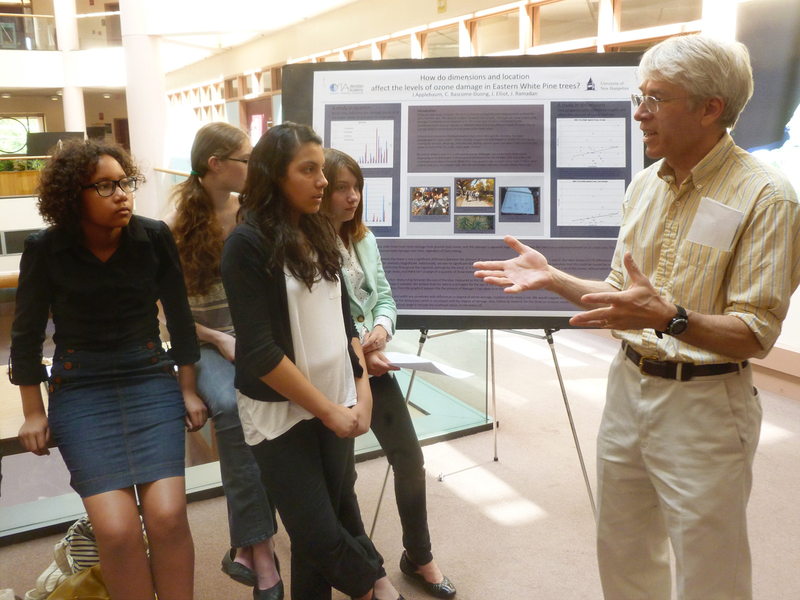 Student convention photos above (left to right): Young scientists explain their work, Bartlett students try microscopy, Meriden students with Dr. Popecki. Additional photos are located the Forest Watch Gallery. Teacher Enrichment Day ON AUGUST 13, Forest Watch teachers are invited to a day of Enrichment. We'll focus on remote sensing and how to make it more user friendly and accessible to your students. Then, we'll turn to photosynthesis and light. Mary Martin will introduce a Do-It-Yourself spectrometer which students can build and use to test on foliage, liquids and many research projects. New friends on the Forest Watch team will stop in to meet you. Dr. Tat Fu, a civil engineer, will introduce his proposals for school energy audits. Dr. Kirk Broders will show us how students can look for fungal predators on white pine needles. The workshop, parking and lunch are free. Register by emailing Martha Carlson at martha.carlson@unh.edu. 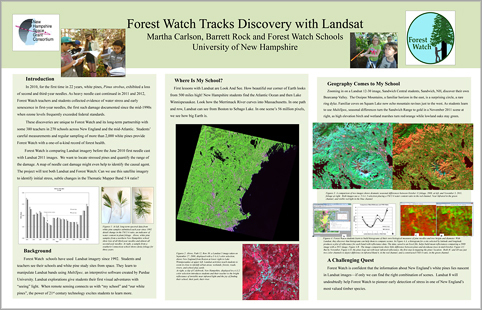 This poster about Landsat imagery highlights Forest Watch’s growing emphasis on helping teachers to learn how to bring remote sensing tools into the classroom. Teachers will focus on this issue on August 13 at Enrichment Day, UNH. Email martha.carlson@unh.edu to register for this free workshop. White Pine Stress Work Continues WHITE PINES in the North Country continue to lose needles this spring. Dr. Kirk Broders has joined the quest for a cause with fungal samplings of every Forest Watch school's spring submissions. 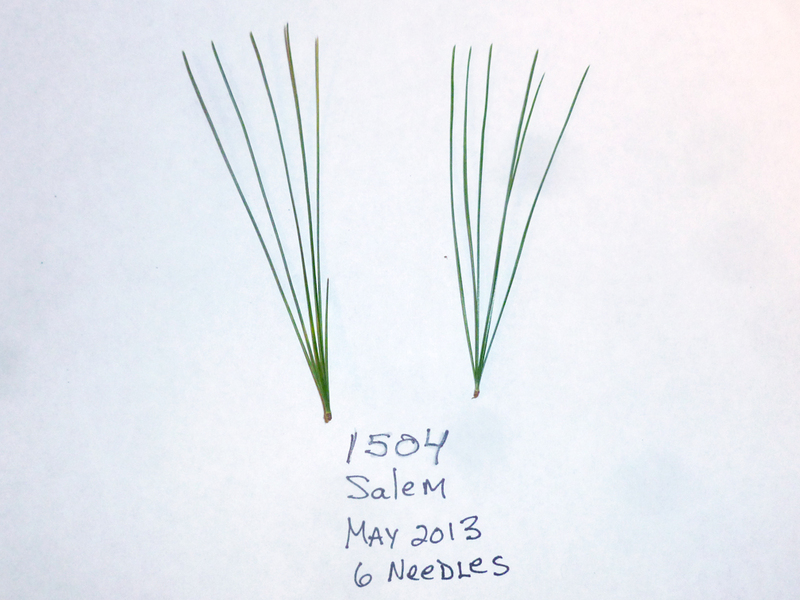 In the Forest Watch lab, Martha Carlson, coordinator, scanned second year needles as well as first year needles. In southern New Hampshire, pines seem to be recovering from whatever stress caused the first needle cast and fungal attacks in 2010. In northern New Hampshire and the Lakes Region, white pines continue to show severe stress. In southern New England, Connecticut pines retained three full years of needles, a bushy healthy contrast to the spindly browning needles found on northern trees. Our research from many schools continues to be invaluable. We'll let you know as we discover more. Learn about the issue in the 2011 Data Book…. Maple Research ContinuesMARTHA CARLSON, our Forest Watch coordinator, is finishing up her PhD this year on sugar maple research. This summer she is crunching data to produce final "report cards" for her 48 sugar maple subjects. She is also working with Dr. Leland Jahnke to answer his question: Are shade leaves different from sun leaves. Chemists are working with Martha to test sap and syrup samples collected by pioneer Maple Watch schools and numerous sugar producers around New Hampshire. We may know by winter if healthy trees have more protective phenolics than stressed trees. Martha has been testing her Maple Watch protocols with numerous visiting students at UNH. We hope to publish these soon on this website. Forest Watch at NHSTA ConferenceDR. BARRY ROCK and Martha Carlson will share Forest Watch wisdom on November 3 and 4 at the New Hampshire Science Teachers' Association conference in Meredith, NH. On Sunday, November 3, we will take a group to the New England Forestry Foundation's beautiful forest on Squam Lake. We'll explore how students can monitor forest and tree health even in winter when leaves have fallen. On Monday, November 4, our workshop will explore "Putting the T and E into STEM Learning." We'll introduce the new do-it-yourself spectrometer and other technology and engineering activities Forest Watch brings to the classroom. Forest Watch Visits SchoolsFOREST WATCH had the privilege of visiting many of our new participating schools and a few veteran schools as well this spring. At Bonny Eagle High School, Standish, Maine, teachers Katelyn Dumont and Amy Hubbard selected five white pines with Martha Carlson, our coordinator. Then we toured a wet hemlock forest where Ms. Dumont and Ms. Hubbard have been researching vernal pools, salamanders and hemlock health. 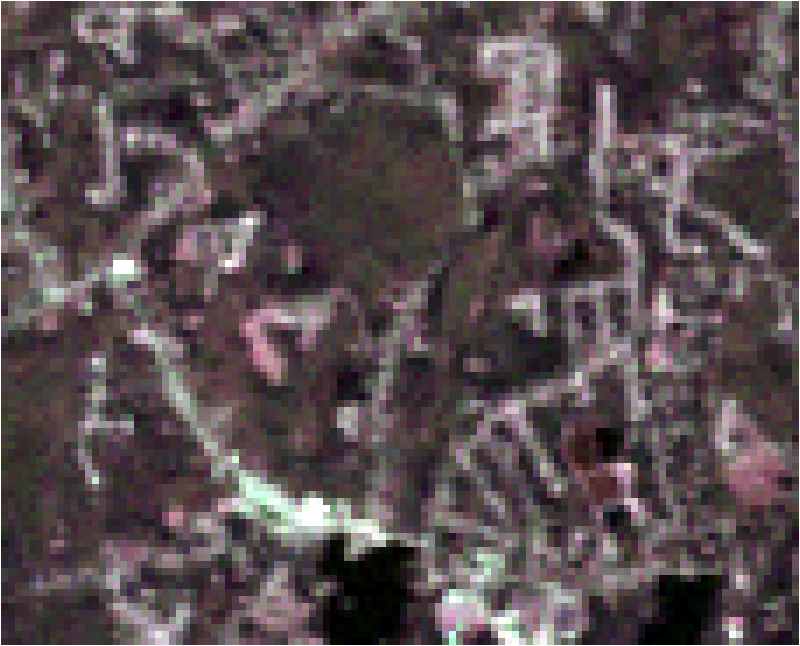 Why not establish the school's pixel for remote sensing studies here, Carlson suggested. Bonny Eagle's pines are restricted to narrow slivers of land along parking lots. The hemlocks offer a rich large area for student research. Students at Westbrook High School in Westbrook, Maine, selected five beautiful pines in their backyard to study with teacher Regan Elsmore. And Mandy Cyr and her students at Biddeford High School showed Carlson a quiet park-like stand of trees where they might study pines as well as many other ecology topics. Here students immediately found seats on a large fallen tree and chatted with Carlson about how they might help build a school ethic around conserving the little park. In the North Country, Bill Emerson and his students are beginning to study pines on a bluff that stands high above the Connecticut River and the mountain intervals where Rogers Rangers waited for supplies in 1759. The edges of the French Pond playing fields are too steep for a pixel study but the team found five healthy pines for study around the soccer field. 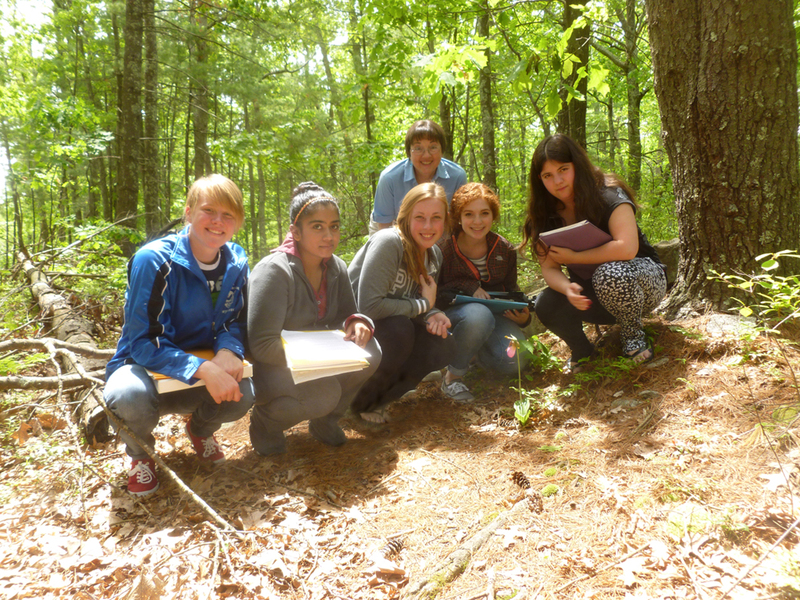 In Windham, NH, Christy Johnson and her students at Windham High School are establishing a Forest Watch site in a pine and oak forest behind the school. Nearby at Salem High School, veteran Forest Watch teacher Norma Bursaw and her senior honors ecologists gave Carlson a tour of their site, a small town park near the school. Pink lady slippers were blooming that day. One of Mrs. Bursaw's students found pine needles this year that grew in fascicles of six, not the classic five. Are these needles lucky like 4-leafed clovers? Salem High School photos, left to right: Forest Watch teacher Norma Bursaw and students, Student photographer and Norma Bursaw, Salem's Lucky Needles.